Supermodel Emme ’85 has selected an evening gown designed by fashion design major Nicole Wezowicz ’16 as the winner of the inaugural Fashion Without Limits 12+ EMME Award™. Fashion Without Limits (FWL) is an initiative launched by Emme and the fashion design program in the College of Visual and Performing Arts to promote the creation of size 12+ designs in the junior year through a special competition. 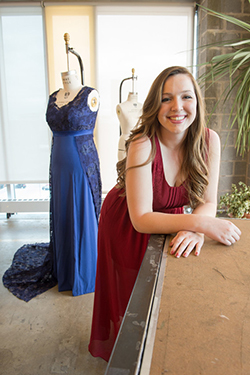 Emme selected Wezowicz’s gown after reviewing the finalists’ designs on campus at the April 10 fashion and beauty communications milestone fashion show presented by the S.I. Newhouse School of Public Communications and VPA. Wezowicz will receive $500, and Emme will wear her winning design at a red carpet event. Wezowicz and her classmates worked on their designs throughout the academic year using dress forms in size 16, 18 and 20 donated by Wolf Form Co. exclusively for Emme and FWL. Wezowicz benefited from the guidance of Emme, who visited the fashion design studios twice to offer her expertise and critique the students’ initial designs. FWL was created in direct response to a need for increased availability of size 12+ fashions throughout all levels of distribution in the fashion industry today. The 12+ represents the size range a majority of American women typically wear, which is often categorized as “plus-size,” for lack of a more acceptable term.